The mayor of a French village has threatened to call in the army to seal it off from an influx of New Age fanatics and UFO watchers, who are convinced it is the only place on Earth that will be spared Armageddon in 2012. 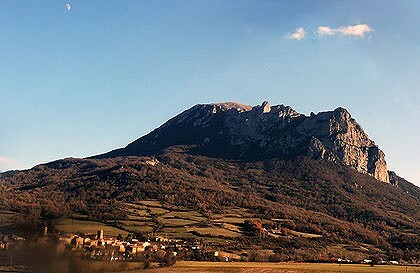 Bugarach, population 189, is a peaceful, picturesque farming community in the Aude region of southwestern France and sits at the foot of the Pic de Bugarach, the highest mountain in the Corbieres wine-growing area. The village of Bugarach, at the foot of the peak. Most believe Armageddon will take place on December 21 2012, the end date of the ancient Maya calendar, at which point they predict human civilisation will come to an end. Another favourite date mentioned is December 12 2012. 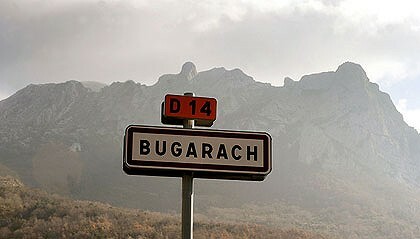 They see Bugarach as one of perhaps several "sacred mountains" that will be sheltered from the cataclysm. "This is no laughing matter," Jean-Pierre Delord, the mayor, said. The internet abounds with tales of the late President Francois Mitterrand being heliported on to the peak and mysterious digs conducted by the Nazis and later Mossad, the Israeli secret service. Recently, however, interest in the site had skyrocketed, said the mayor, with online UFO websites advising people to seek shelter in Bugarach as the countdown to Armageddon commences. Sigrid Benard, who runs a local guesthouse, said UFO tourists were taking over. "At first, my clientele was 72 per cent ramblers. Today, I have 68 per cent 'esoteric visitors'," he said. Several "Ufologists" have bought properties in the hamlet of Le Linas, in the mountain's shadow, for "extortionate" prices and locals have complained they are being priced out of the market. Strange sect-like courses are held for up to euros 800 a week. "For this price, you are introduced to a guru, made to go on a procession, offered a christening and other rubbish, all payable in cash," said Mr Delord. Valerie Austin, who is originally from Newcastle upon Tyne but settled in Bugarach 22 years ago, said the alien watchers were spoiling the village atmosphere. "You can't go for a peaceful walk any more. It's a beautiful area, but now you find people chanting and lying around meditating." Although she described the alien claims as "total rubbish", she said there was nevertheless "something special" about the area. "It has a magnetic force in the scientific sense of the word. There is a special feeling here, but if I really believed the world were about to end, I'd have a whale of a time over the next two years rather than look for salvation," she said. Yes well they're not welcome in my garage either. Bloody UFO watchers. What if the doomsayers have got it wrong and the actual ground zero alien garage is at Ayers Rock and they take a few of the locals and some half starved dingos away with them. 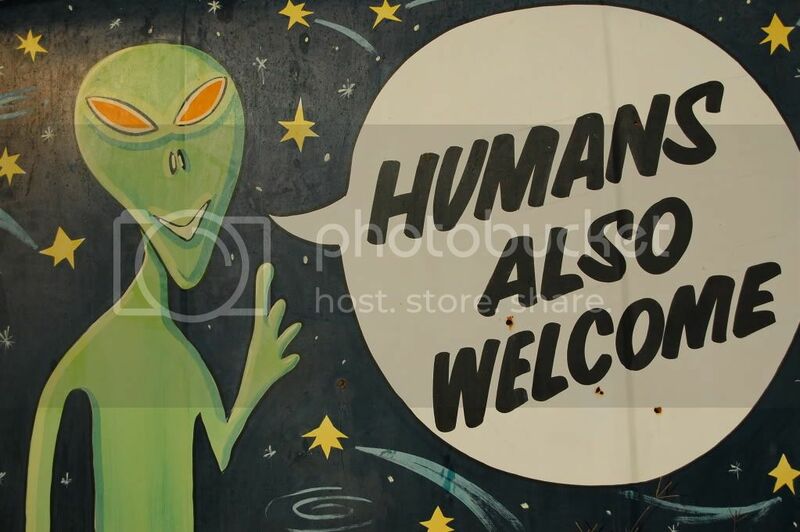 That'll show them....those peskie aliens will have no desire to come back here again. Our mayor got together with the mayor of the next town, Arès, and they dedicated a stretch of beach as a UFO landing zone. It was argued that they are not landing here because there was no facility. Well we now have it. "la ville d'Arès possède un terrain d'atterrissage unique au monde depuis le 15 août 1976 : il est réservé aux objects volants non identifiés. L'idée en revient à Robert Cotten, électronicien. Si l'on voit atterrir si peu d'OVNI, a-t-il déclaré, c'est parce qu'on n'a pas fait grand chose pour les accueillir". Aujourd'hui la borne se trouve toujours en bordure de la plage d'Arès et porte le texte suivant : "OVNIPORT ARES : Le 15 août 1976, ce site a été réservé, par décision de Monsieur le Maire Christian RAYMOND, approuvée par le Conseil Municipal pour accueillir sur notre planète les Voyageurs de l'Univers. QUE VOS ATENDEM TOTJORN (nous vous attendons toujours). Bob COTTEN et un honorable groupe d'Arésiens sont à l'origine de cette initiative reconnue du monde entier." If I was flying an UFO, I would certainly park somewhere in Australia. Plenty of flat, it's got to be cheaper to park? Just a belated thought - why would anybody want to watch you? Or perhaps we should not go there! Only for the opportunity to bask in the glow.... Butyou have your followers too.